(Metric and US units) This is our most popular program. Analyze single or multiple span beams. Add almost any load combination you need. You will get shear, moment and deflected shape diagrams. A full AISC ASD code check will be performed against the 9th edition of the code. Note, the code check will not be performed when Metric units are used, but you will get the stress information. The Archon Beam Analysis Program is designed to provide a quick method for the Engineer to obtain beam moment, shear, stress, rotation and deflection values. The program will analyze most of the single span beam configurations shown in the AISC manual 9th edition as well as multi-span beams, with up to 50 spans. This version of the program also allows the user to place several different load types on a single beam. The program also provides a data base which provides AISC Shape section properties. This data base complies with the 9th edition of the AISC (ASD) Manual of Steel Construction. 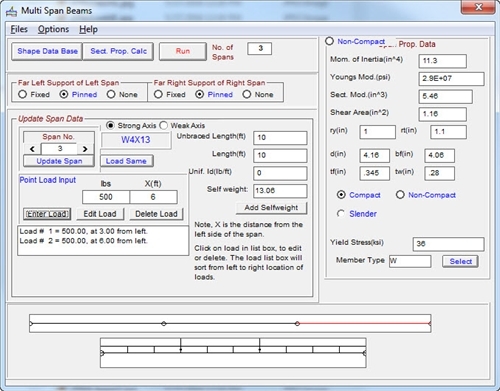 calculator and the shape data base will directly transfer to the beam analysis portion of the program. The multi-span and single span output screens display a shear, moment and deflected shape diagram of the system. Finally, the program has a function to calculate torsional shear stress on selected solid and closed members. The single span beam input allows input of an axial load. By adding an axial load you can use this program to review columns. The program will accept input in Metric (SI units) or US System. Note, the code check function is only available if the US system of units is used. The SI units system will provide actual stress values. All output data, including the shear, moment and deflection diagrams can be printed. Compatible with 64-bit versions of Windows.